The Texas summer is in full swing now. The highest temperature for an average day is now above 100F, that would be almost 38C; yes the high school mathematics is of much help these days. Texas summers are hot and dry, and for me there is no chance of going out in the afternoon. Though I have seen many people love the sun and go for running especially during midday. I hate summers, the heat, the sun, almost everything about it. But, the only two things I love during this time of the year is of course the worry free binging on ice cream and the abundance of berries. I love ice cream, as long as there is no chocolate involved; yes you heard it right, I don’t like chocolate ice cream. When we talk about ice cream, one thing I miss after coming to the US is the tall dark mustached kulfi-wala who used to come to our neighborhood during the summer afternoon with his big red cloth covered handi on the back of his cycle. Kulfi, the indigenous Indian ice cream is generally made with non-homogenized milk, boiled to a thick consistency, the creamy fat on top of the milk is called malai, and that where malai kulfi name came from. 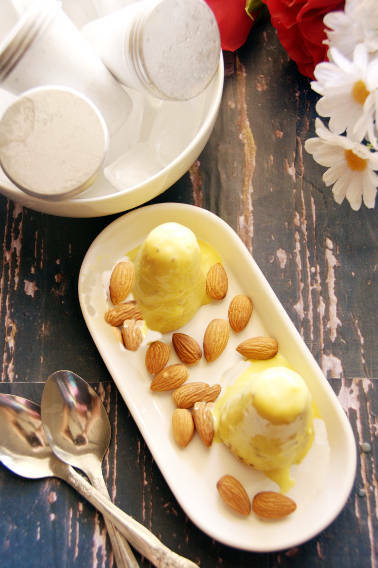 Apparently, kulfi was first made in the kitchen of Mughal emperor, Akbar. The ice was brought from the Himalayas to freeze this ice cream. While malai kulfi is the most commonly prepared kulfi, you can also use mango puree to mix with the kulfi mixture to prepare mango kulfi. In a blender blend the blanched almonds to a thick paste. Now keep the pan over low flame and bring it to simmering bowl, stirring often. Take out about one-fourth cup of the boiling mixture and immerse the saffron in it. Once the saffron is dissolved and color turn yellowish, pour it back in the pan. Give it a stir. Take out of flame and fold in the almond paste and cardamom powder. Let the pan to cool down completely. Mix the chopped pistachios and almonds. 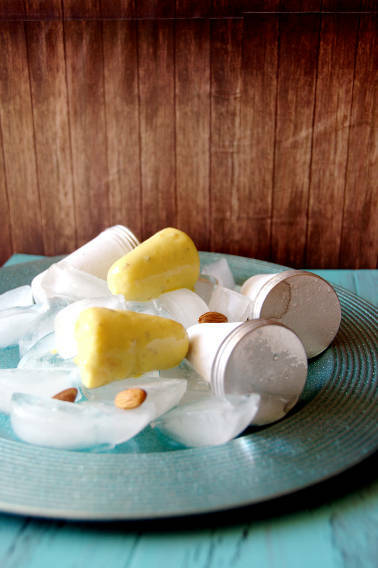 Pour the mixture in kulfi or popsicle molds, and freeze for at least 6 hours. The best way to take out the kulfis without breaking them in halves is to pour hot water over the mold for a few seconds and then inverting the molds on a plate. The kulfi will come out smoothly. 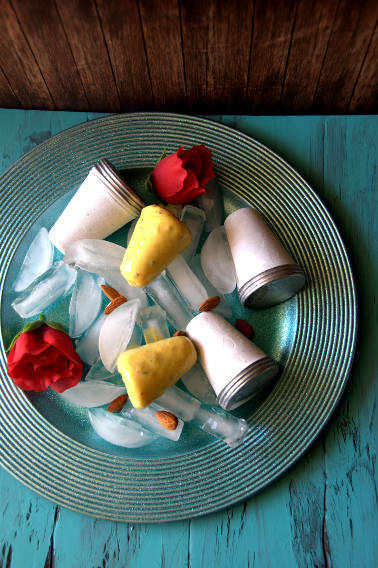 To give the kulfi a mughlai flavor, you can use a drop of rose water and keyra water. If you don’t have kulfi molds at home, use paper or plastic disposable cups. I couldn’t get the meaning of the ingredient called “half and half”. Please explain me.